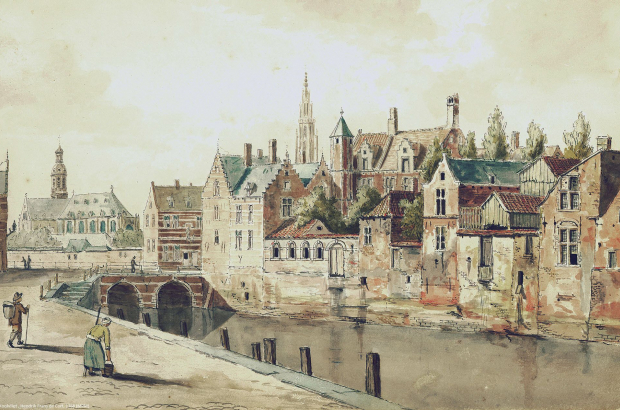 The streets of Antwerp, Ghent and Bruges will give up their history, thanks to an innovative new research project that will digitally match maps, archives and other sources of historical information. The result will be a unique way of visualising and accessing the past. The initiatives in Flanders are part of the €1 million Time Machine project, which is being launched today in Brussels. Co-ordinated by the Ecole Polytechnique Fédérale de Lausanne in Switzerland, it involves 33 universities, archives and institutions from almost all European countries. Earlier this month Time Machine was named one of six large-scale research initiatives to be supported under the European Union’s Horizon 2020 programme. It is particularly unusual for a project in the humanities to attract this kind of backing. Antwerp’s contribution to the project will involve exploring how mapping and language technology can be combined. “We’re going to link all possible historical sources, ranging from old maps and manuscripts to archives and visual material, based on location,” explained Ilja Van Damme of the university’s Centre for Urban History. The Antwerp Time Machine was one of the pilot projects set up in preparation for the bid for EU funds, and so is already well under way. Ghent University will follow its lead, building time machines for Ghent and Bruges, from the middle ages to the present day. This will involve bringing together fundamental research in the humanities with information and communication technologies. “We see this project primarily as a lab for co-creation with both local heritage players and our colleagues in ICT research and cartography,” says Jeroen Deploige, of the university’s Henri Pirenne Institute for Medieval Studies. Ghent’s engineers and geographers will contribute expertise in web and database technologies that will help make heritage data accessible. As well as drawing on material from archives, libraries and museums, the aim is also for members of the public to contribute to the time machines, for instance uploading family photos and documents. This will help fill in gaps, such as the stories of 20th-century immigration to Flanders, which can then be connected with specific locations. More broadly the goal is to build an extensive Time Machine network throughout Europe. “Obviously, smaller cities don’t have the means to develop the technology themselves, but in the long term they will be able to participate through a franchise model,” Kestemont said. As for users, the time machines will offer exciting new opportunities to educators, for example allowing students to experience events in virtual reality, such as the storming of the Bastille or the Battle of the Golden Spurs. The project is also expected to encourage local initiatives in tourism and cultural entertainment, and new approaches to urban planning.